In a large bowl, whisk together whole-wheat flour and rolled oats. Mix in the smooth or chunky peanut butter and hot water using your hands, a wooden spoon, or a mixer. If the dough is too sticky, add more flour. If the dough is too stiff and crumbly, add more water. Knead the dough by hand or with a dough hook on a stand mixer. Round it into a ball and cover with plastic wrap and let it rest 15 minutes on the countertop. Heat oven to 350 F. On floured parchment paper, roll out the dough to 1/4-inch thickness and cut into shapes with cookie cutters of choice. 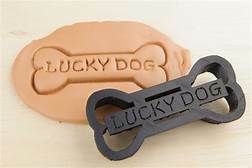 Try a bone cookie cutter. Since the dough doesn't spread while baking, you can cut the biscuits close together directly on the parchment paper. Remove scraps of dough in between the shapes. Pick up the parchment paper at opposite ends and transfer it to a baking sheet. Repeat with remaining dough. Bake 40 minutes. For best results, after they finish baking, turn off the oven and let them sit in the oven to cool overnight. The dryer they get, the longer they will stay fresh. If you can't wait for them to crisp up overnight, then after baking, remove them to a wire rack to cool completely and treat your doggie to a guilt-free snack. Note: If your dog has wheat allergies, try making these with another flour like rice or potato flour, but the amount of water might have to be adjusted. If peanuts are a known allergen for your best friend, try soy nut butter or a different nut butter.